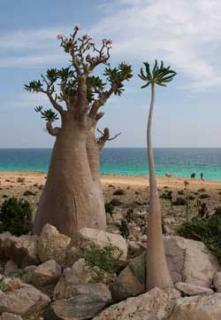 The Socotra Archipelago covers an isolated group of islands and coastal areas that are known for their plant biodiversity. They are located at a 'cross-roads' of the Arabian Sea, Red Sea an Indian Ocean. Its long isolation has led to the preservation of an ecosystem that has disappeared elsewhere. Combined with its climate, characterized by fierce heat and drought and a short monsoon season, Socotra has survived as a pristine, unique and spectacular endemic environment. The smaller islands in the archipelago even have their own endemism. Unique en medicinal plants are found such as the bitter aloe, myrrh, frankincense and the distinctive dragon's blood tree (relict elsewhere). Destroyed by Hurricanes or Typhoons: Cyclone Megh (Nov 2015): "... number of homes have been destroyed and 5,000 more displaced people have fled the northern shores of the island to schools, universities and hospitals"
8 Community Members have visited.